Some of our vendors do a lot more than big retail in ZenShows. I'm happy to announce that we now support custom location lists to allow you to setup your own retailers or event locations that can be anywhere on the planet. Currently the feature is only available to vendors but we are happy to open it up to agencies as well - just let us know! To access the feature go to your lists page. There you will see a new section called "Private Retailers". What can I say.... I love what I do! When I started ZenShows so many years ago I knew I was on to something but had no idea how rewarding it would be to help so many clients build out their businesses. Thank you for letting me be part of your journey! With so many features getting added to ZenShows practically every single day I need a place to communicate the latest for everyone to utilize. Please check back here often for updates and improvements. I look forward to hearing from you. Announcing Support for Whole Foods! CostcoPetSmartWinCoSams ClubWalmartLowesHome DepotCVSDaves MarketsRosauersBig YHyVeeCostco CanadaWhole Foods We are excited to see our retailer list grow. And speaking of growth, we have 1.2M sales data records now in ZenShows across over 75,000 events and nearly 200,000 checkin/outs! More features! We installed a fun one last night to autosum groups of cells on the Inventory Reconciliation pages. As you can see, by clicking on the cell or clicking and dragging you can add cells to the total that shows up in Red next to the cursor. This will allow you to arbitrarily sum different items when you are trying to sort out your inventory at an event. Please don't try to add things like text as that will zero out the sum. Also note that you can use shift-select to unselect groups of cells as well. BJs is now uploaded in ZenShows for use with your events. Full support for monitoring your event performance coming soon. By popular request we have added the ability to have notes attached dispatches and inventories. This will allow you to enter extraneous information into these places in ZenShows for use internally or with your representatives. Schedule templates are one of the more powerful features in ZenShows when it comes to managing your events. One thing I should try to clarify as long as we are talking about templates is absolute vs relative times. For some retailers we try to keep their open hours up to date in ZenShows. If a location has hours of operation that you save a template from then that template can be saved as a "relative" schedule. What this means is that the start and end times for the schedule are saved relative to open/close hours for that location. And then when you load the template to a new location we use that locations open/close hours as the basis. First in your products setup you need to make sure you have entered weights for the various items. Ok, you have been asking for awhile now. Finally we have the ability to delete and edit the names of your schedule templates. You can find it under profile -> Schedule Templates. Give it a whirl! 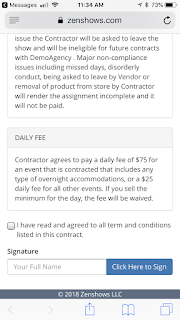 As more and more clients are using our forms to get summaries, contracts with staffers, collect images, etc it becomes more and more of an effort to insure compliance. We have installed a new report for all Vendors and Agencies that will keep track of all your outgoing forms and allow you to follow up on those that have not been completed. Just select the form you are after, what date range you are looking for (including upcoming events) and sort. As with all reports, you can customize the report and have it automatically sent to you on whatever schedule you choose. We recommend setting it up so that you look at all incomplete forms for events starting next week and have that emailed to you every monday or so. Don't forget, we can also collect signatures on documents!